People tend to focus on the peak mornings of the shower and that’s entirely appropriate. But meteors in annual showers – which come from streams of debris left behind in space by comets – typically last weeks, not days. Perseid meteors have been streaking across our skies since around July 17. We’ll see Perseids for 10 days or so after the peak mornings on August 11, 12 and 13. What’s more, the Perseids tend to build up gradually, yet fall off rapidly. So it’s possible to catch Perseid meteors now. Looking at images in @userTLK's excellent answer to "What (actually) is Jupiter doing to this year's Perseids meteor shower?" one can imagine the Earth passing through a "fuzzy tube" around the orbit of the shower's associated comet's orbit, which is often inclined with respect to the ecliptic. So far I can't imagine a mechanism that would make the ramp-up and then ramp-down happen at very different rates. Why would the Perseids meteor rate fall off after maximum faster than the increase before maximum? I've just found this artist's conception of the "fuzzy tube" of debris in Sky and Telescopes's “Great Show” Predicted for Perseid Meteor Peak on August 12–13. 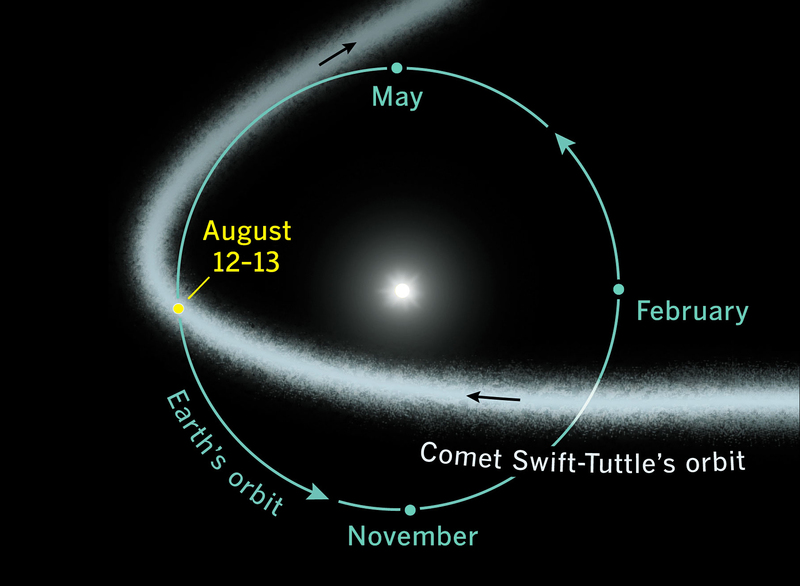 above: "Every year, in mid-August, Earth passes collides with particles spread along the orbit of Comet Swift-Tuttle." Credit Sky & Telescope, from here. A very interesting question. Neither Bruce McClure at EarthSky nor I knew the answer, despite the fact that the observed gradual rise in numbers for the Perseids - and their quick drop-off - is something we've both observed for decades. So we asked a true expert on meteor showers, Robert Lunsford of the American Meteor Society. He also said: "Good question!" And, he said: "It seems that the particle density of the meteor stream [what you're calling here a 'fuzzy tube'] is greater prior to maximum than after. Perhaps the core of the stream, which produces maximum activity, is not quite centered in the stream. This is true for some other major showers such as the Geminids. The core of the Geminids must be really off-center as the display nearly disappears 48 hours after maximum. Gravitational effects from the sun may also play a role in this shift." So here, as so often in astronomy, the answer suggests our knowledge of nature is - at present - inexact. Are any of you old enough to remember when the Voyager spacecraft first encountered Jupiter? Nowadays, we're used to seeing the very detailed images of Jupiter's cloud bands, but when we first saw that detail - via the Voyagers in the late 1970s - we were blown away! The situation with meteor streams in space is likely exactly the same. We picture them as symmetrical only because we don't have instruments refined enough to reveal their structure. All we have are the long-observed rates of meteors in annual showers - such as the Perseids and the Geminids - suggesting that meteor streams do indeed have a structure. It most probably has to do with orbital mechanics and the generation of the meteoroid stream (and not "meteor stream"...). A possible element of explanation is a differential precession, due e.g. to particle size, but this alone cannot explain all the observations. Another possibility is a variation of the amount of dust ejected by the parent body as a function of time, knowing that between two different perihelion passages (and hence 2 different ejection epochs), the parent orbit has changed. The net result is a region of the stream highly populated and another one less populated. Though this is hard to prove without direct observation of the dust production as a function of time, it is a reasonable explanation, but surely not the only one. Not the answer you're looking for? Browse other questions tagged comets meteor-shower or ask your own question. What is the direction of a comet's dust tail before and after perihelion?